OK -- it's been a few days, and in the meantime the markets have decided to hyperventilate about the Bernanke presser. So, let's take a minute to look at exactly what he said and what it means. Starting about 4:30, Ben explains the two programs the Fed is using. The first is interest rate policy, which is still going to be low for a long time. Here's the exact wording from the Fed statement: In particular, the Committee decided to keep the target range for the federal funds rate at 0 to 1/4 percent and currently anticipates that this exceptionally low range for the federal funds rate will be appropriate at least as long as the unemployment rate remains above 6-1/2 percent, inflation between one and two years ahead is projected to be no more than a half percentage point above the Committee's 2 percent longer-run goal, and longer-term inflation expectations continue to be well anchored. So, we have a three-pronged set of factors to use when evaluating when rates may increase: unemployment about 6.5%, future inflation is lower than 2.5% and inflation expectations are well anchored. Ben specifically notes these are thresholds, not targets, so even if we do hit those targets, rates could stay low. Let's turn to the asset purchase program, which he starts explaining at 8:00. Currently, the Fed is purchasing assets at the following monthly pace: $45 billion in Treasuries and $40 billion in agencies. The fed may moderate this later in the year, with the potential to end the program by next summer. He notes the pace is not predetermined, but instead is highly dependent on incoming economic information. If the economy improves, the pace will quicken; if the economy slows, the pace will slow or the program will end entirely. Rates have moved about 2% and are now approaching 2.5%. While this rate is still low, that lowness is relative. In comparison to our recent rate experience, it's actually getting high. Also note the Fed will continue to reinvest maturing principle (see statements beginning at 9:30). This could be a key point, as the Fed may think they have enough financial ammunition already on their books to keep rates low. For more on the overall effect, see NDDs piece below. Now let's entertain the question of whether or not this is a good idea right now, starting with an obvious although overlooked point: asset purchases have to end sometime, it's a matter of when. Now -- is this time the appropriate time? Ben notes that unemployment has dropped since the plan was initiated. He also sees current moderate growth. Here's where I think he makes a big mistake, quoting from the Fed release. The Committee sees the downside risks to the outlook for the economy and the labor market as having diminished since the fall. I don't think this is the case at all. Consider the following points. The fed admits that we're facing fiscal headwinds thanks to the bozos in Washington ("fiscal policy is restraining economic growth."). Manufacturing is slowing thanks to a slow international environment and general tentativeness domestically. One of the key bright spots in the economy is housing, which the Fed's move will hurt by increasing interest rates. Wages aren't going to meaningfully increase in a 7.5% unemployment environment and refis -- which have been proving a fair amount of the financial fuel for consumer purchases (see NDD below) -- are going to drop in a higher rate environment. And the international environment is terrible. The EU -- which is the second largest economic region after the US -- is in a depression. China is clearly slowing, which is having a pronounced negative effect on the developing world. The three other BRICs are all experiencing their own problems: India has slower growth, high current account deficits, systemic political paralysis and high inflation. Brazil's growth is slowing and their inflation in far higher than preferred, meaning their central bank can't lower rates to stimulate growth. And Russia is fast becoming a basket case. In short, I think the Fed is dropping the ball on this one. You may have heard on your car radio or on television last night after you came home from work that the stock market had a bad day, dropping about 2.5%. Probably the newscaster said something about it being a reaction to the Federal Reserve Bank's announcement that it expects to "taper" its purchases of long term bonds in the near future. While the daily gyrtions of the stock market are not worth getting excited about, IF the "taper" happens, it likely will affect you. Let me explain why. The graph starts in 2008 at the depths of the recession. Note that refinancing was at its low ebb. Since then and especially in late 2011 and 2012, with record low mortgage rates refinancing has boomed. At the far right of the graph you can see the last month's spike in mortgage rates, and the steep decline in refinancing back to mid-2011 levels. 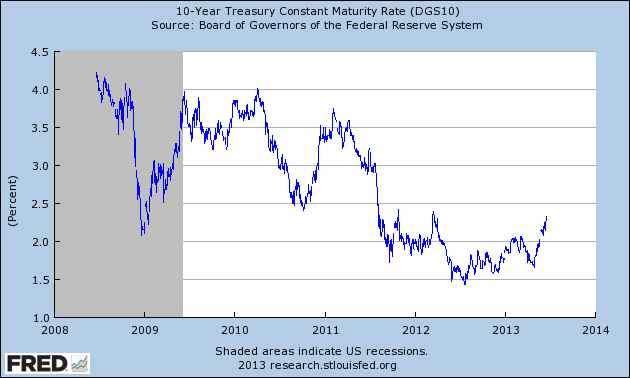 Simply put, the more the "taper" causes interest rates to rise, the less refinancing of mortgages we will see. We'll probably also see a decline in the amount of purchases of new homes as well, since purchasers will also be faced with hgher mortgage rates. Finally, let me point out that in the above analysis, I am being like the Ghost of Christmas Future in "A Christmas Carol." I am not showing you what will be; only what might be. All of those bonds I mentioned above, being sold by traders? Other traders bought every single one. There are some people who think the upward move in interest rates is overdone, and they see a buying opportunity. In other words, there is no certainty that the Fed "taper" will cause interest rates to move higher than they already have. Even more importantly, Bernanke premised the "taper" on unemployment moving to 7% or below. If the economy slows because of anticipated or real higher interest rates, we won't see unemployment moving under 7%, and then the Fed is likely to reconsider and not "taper" at all! In other words, it could be a self-unfulfilling prophecy. First, we see a nice bump in GDP during the first quarter with the .8% Q/Q print. But notice the big change in the composition of growth. PCEs declined .1%. To make up for the loss, we see increases in in capital formation of 3.8% and exports of 3%. The real issue on the year over year basis is the drop in facilities investment, which contracted at a very sharp 11.9% reate. PCEs are also weak at 1.5% which is partially explained by the high level of household debt that currently stands at 160% of annual incomes. Government spending is also weak at a 1.3% increase. South Korea unveiled a Won17.3tn ($15.4bn) supplementary budget on Tuesday to support the stalling economy, as domestic consumption remains sluggish while exports slow because of the weaker yen and cooling global demand. The supplementary budget was larger than expected, mainly because it contained plans to raise debt to make up for anticipated tax revenue losses resulting from the slowing economy, and delays to the attempted sale of state holdings in two banks. 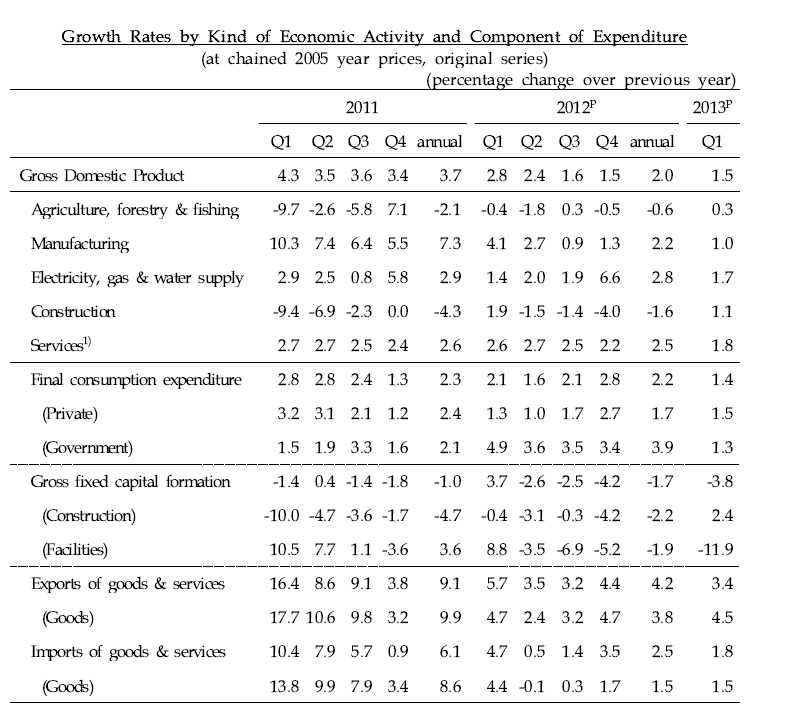 In Korea, consumption and facilities investment have declined but the Committee appraises economic growth to be continuing, albeit weakly, as exports have improved and construction investment has increased to a great extent. On the employment front, the number of persons employed has increased, centering around the 50-and-above age group and the service sector. Due to a slowdown in the uptrend in employment in the manufacturing sector, however, the increase was smaller in May than in the previous month. Going forward there is no change to the Committee’s forecast that the domestic economy will show a negative output gap for a considerable time, due mostly to the slow recovery of the global economy. There are no signs of an imminent collapse. But it does appear the SK economy is entering a slow growth phase. Over the last week, prices have fallen to near nearly lows on a declining momentum and CMF reading. The strong moves lower over the last few days are all the result of the Fed tapering talk. The rest is about a slowing economy. The Pied Piper of Doom: "I only mentioned a double dip once." BWAHAHAHAHAHA!!! Over at the Great orange Satan, there is presently a little kerfluffle over who or what should get credit for the recovery. I think most people who also read this blog as well won't be surprised that I think the truth is more multifaceted and nuanced. 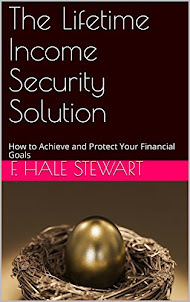 New Deal and Great Society programs like Social Security, food stamps, unemployment insurance, and disability did not prevent the great recession, and they didn't cause the recovery. On the other hand, they acted as stabilizers, to some extent cushioning the impact of the Hard Times. Further, it is widely accepted that the 2009 stimulus did have a positive multiplier effect. It certainly helped, but many believe it should have been larger, and some points were poorly designed -- "rim shots" as Atrios called them -- but did help. Tax cuts may not have been the best approach, for example, but spending by the 75th to 95th percentile is where the biggest boost was to be found. UPDATE: The biggest kudos, though, should probably go to Ben Bernanke. The Fed's quantitative easing program brought long term interest rates down enough and long enough for millions of homeowners to refinance at lower mortgage rates, freeing up money for spending on other items and paying down other debts. The rest I'll leave to the partisan activists, but I can't let pass without heaping well deserved derision on the Pied Piper of Doom's claim that he only brought up the possibility of a double dip recession once, reporting neutrally on and certainly not embracing or touting ECRI's recession call in September 2011. Which is recommended by the PPoD along with a note that there is no housing recovery -- right at the moment that YoY house prices turned positive and haven't looked back since. The Markit Eurozone PMI® Composite Output Index rose from 47.7 in May to 48.9 in June, according to the flash estimate, indicating the smallest downturn in business activity since March last year. The sub-50 reading nevertheless rounded off another weak quarter. At 47.8, the average reading for the three months to June is only marginally higher than the 47.7 average recorded in the first three months of the year, suggesting that the eurozone’s recession will have dragged into a seventh successive quarter. Although activity continued to decline overall, the third consecutive monthly rise in the PMI in June indicated that the rate of contraction is on a moderating trend. Manufacturing output fell in June at the slowest rate in the current 16-month sequence, registering only a very modest decline, and services business activity showed the joint-weakest fall since March 2012. Adding to the picture of the downturn moderating, new business fell at the slowest rate for five months, the rate of decline having eased for the third month in a row. New orders in manufacturing fell only marginally, registering the smallest decline for two years, while the services sector saw the smallest fall for five months. Expect a fair amount of hype about the slowing trend in the downturn, along with a special emphasis on the possibility of the EU coming out of the depression in the second half of 2013. Don't believe the hype. First, this is the sixth quarter of negative growth. We're now entering the possibility that a continued slow pace of expansion is the new norm. The region is not only still experimenting with the incredibly backward idea of austerity but their export markets are growing modestly at best. And the political leadership has absolutely no foresight. 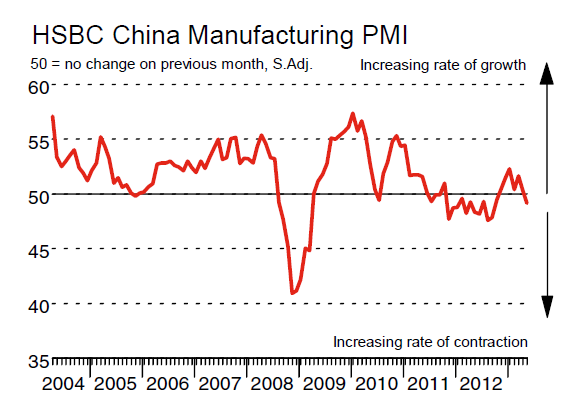 After adjusting for seasonal factors, the HSBC Purchasing Managers’ Index™ (PMI™) – a composite indicator designed to provide a single-figure snapshot of operating conditions in the manufacturing economy – posted at 49.2 in May, down from 50.4 in April. This signalled the first deterioration in operating conditions in seven months, albeit at only a marginal pace. Note that the index spent most of 2012 below 50, indicating contraction. Now traders are concerned we're seeing that trend start again. Output continued to expand across both the manufacturing and service sectors for the seventh consecutive month in May. However, production at manufacturing plants rose at the weakest pace since October 2012 and business activity at service providers increased at a modest pace. 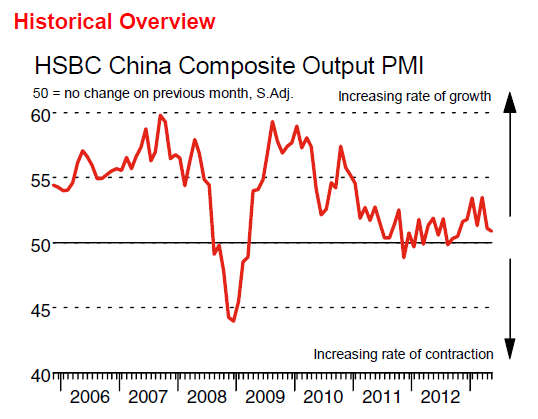 The latter was signalled by the HSBC China Services Business Activity Index, which posted 51.2 in May. This was broadly unchanged from April’s 51.1 and was one of the lowest readings in the series history. Total new orders were relatively unchanged in May at the composite level, with sector data indicating differing trends. New work intake at manufacturing plants fell modestly over the month and for the first time since last September, while new business increased at service providers. However, the rate of growth was modest and remained historically weak in the service sector. While still positive, we've seen a few months of lower prints. This is hardly fatal, as this sector hasn't meaningfully contracted in over two years. But it is something to keep your eye on. China’s trade, inflation and lending data for May all trailed estimates, signaling weaker global and domestic demand that will test the nation’s leaders’ resolve to forgo short-term stimulus for slower, more-sustainable growth. Industrial production rose a less-than-forecast 9.2 percent from a year earlier and factory-gate prices fell for a 15th month, National Bureau of Statistics data showed today in Beijing. Export gains were at a 10-month low and imports dropped after a crackdown on fake trade invoices while fixed-asset investment growth slowed and new yuan loans declined. Industrial production compared with the median estimate for a 9.4 percent increase, with growth the weakest for a January-May period since 2009. Fixed-asset investment excluding rural areas rose 20.4 percent in the first five months from a year earlier, down from a 20.6 percent pace in January-April, statistics bureau data showed. May’s retail-sales growth of 12.9 percent matched the median projection of analysts. May exports rose 1 percent from a year earlier, down from 14.7 percent in April, while imports dropped 0.3 percent from a year earlier. The median estimates of analysts were for 7.4 percent export growth and 6.6 percent import gains. The $20.4 billion trade surplus compared with forecasts for $20 billion. “This shows the real state of the Chinese export situation,” said Shen Jianguang, chief Asia economist at Mizuho Securities Asia Ltd. in Hong Kong. The data give a “pretty depressed” picture, with weak external demand and a yuan that has appreciated substantially against a trade-weighted basket of currencies, said Shen, who previously worked at the European Central Bank. Bear in mind that China needs rapid growth because of two inter-related factors: the world's largest population and its GDP per capita. In order to create a large enough economic "pie" to spread out over its population and thereby raise people out of poverty, we need to see strong growth figures. 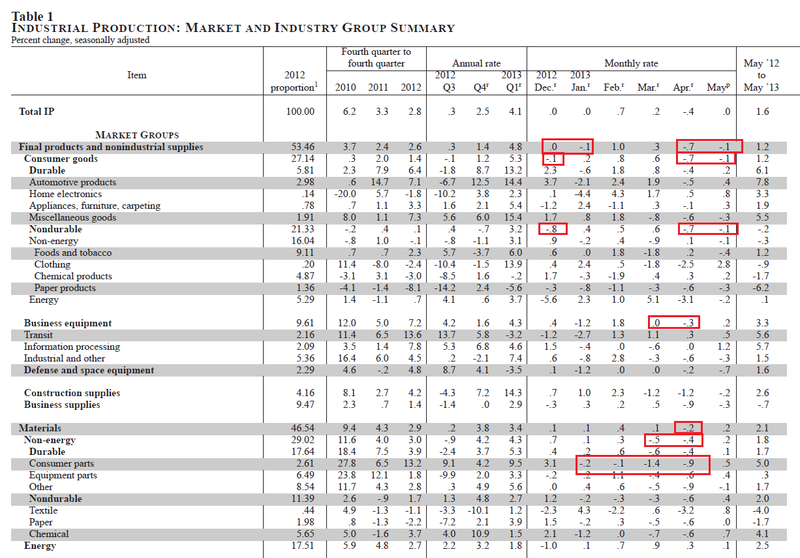 That's why industrial production prints of 9.4% are concerning to economists. Now, let's also stipulate the Chinese slowdown is "relative" and no one is predicting a crash. These are still good numbers; they just indicate things are slowing relative to what we've seen. The concern about China’s slowdown is grounded partly in the speed with which credit is growing in China. The figure for total lending, which includes the non-banks as well as the banks, hit nearly Rmb8tn ($1.3tn) in the first four months of the year, significantly higher than the Rmb4.85tn for the same period a year ago, according to JPMorgan. Today, China’s total credit is almost double its gross domestic product. But more worrying is the declining efficacy of that credit. The amount of capital being put to work is swelling, but the productivity of that capital is plummeting. Five years ago, a dollar invested produced a dollar of GDP growth. But today it takes $3 to $4 of investment to produce a dollar of output – and the quality of that output is suspect. There is overcapacity across many Chinese industries, from shipbuilding to solar. The decreasing efficacy of Chinese lending is a policy problem, because this is the preferred method for the Chinese government to goose economic growth. The short version of the above data points is it is becoming more and more apparent that the Chinese growth story is changing. And that has tremendous ramifications for the rest of the world. The Chinese market is consolidating in a descending triangle formation, with the top part of the triangle connecting the early February and last May highs and the lows established on the 38.2% Fib level. 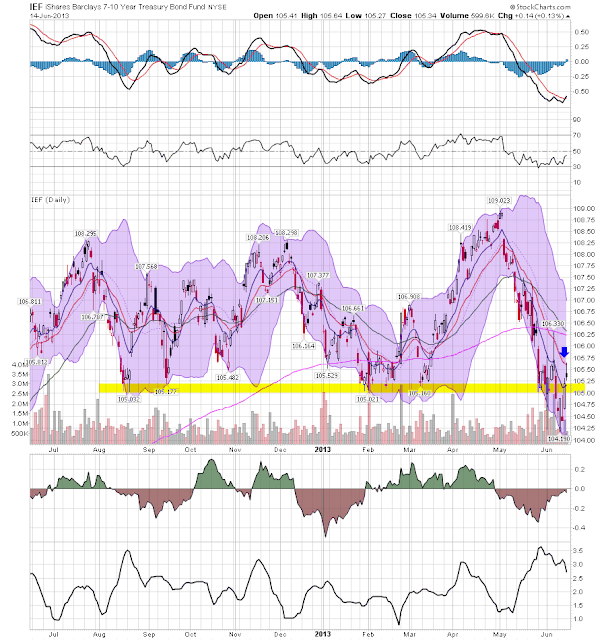 A break of the 2150 level would indicated a move lower. 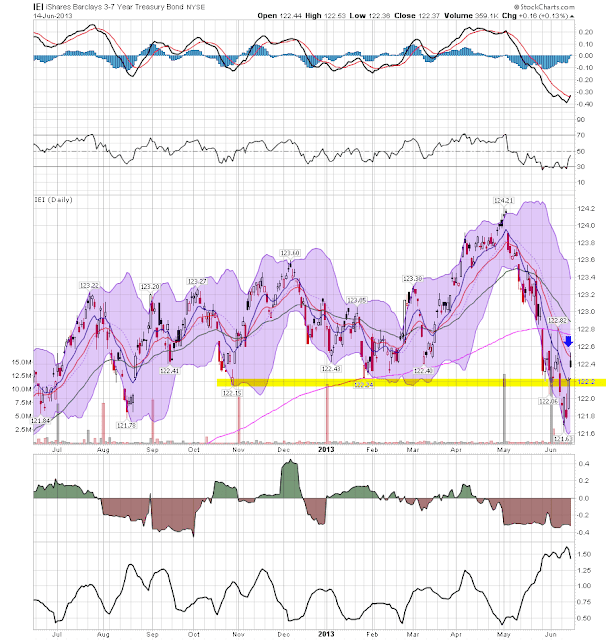 Also note that prices are below the 200 day EMA with the shorter EMAs moving lower. The Federal Reserve's report on household debt burdens was released earlier this week covering the January - March quarter. 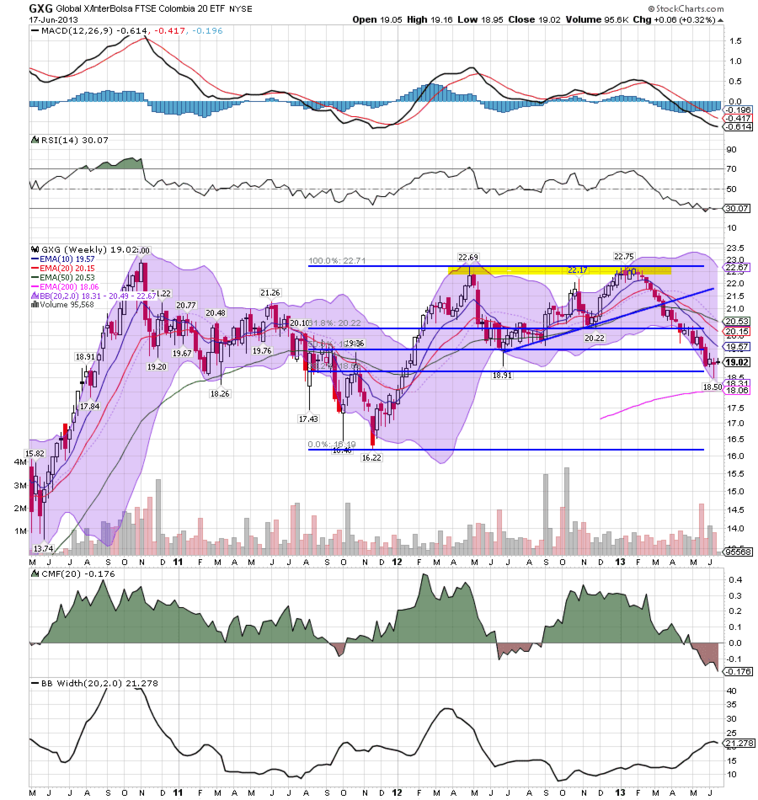 I have been watching these series since before the Great Recession. Indeed, when household debt burdens started to decline, that was one of the final signs that the Recession was about to start. Further, I long suspected that, before this cycle was over, households would set new all time lows for debt service. With the exception of one quarter in 1980 (as to total financial obligations), that happened in the final quarter of last year. I have noted a number of times that refinancing increased in 2011 and 2012 with new record lows in mortgage rates, and probably played a major role in keeping the economy from tipping back into recession. Now, for the first time in four years, household deleveraging has stopped. Whether we have already hit the absolute bottom or not is impossible to say, but it certainly appears that the bottoming process has begun. It's also worth noting that the willingness of households to re-leverage, even slightly, bespeaks increasing confidence about the future. Recall that this has also shown up in recent consumer confidence readings, which have made 5 year highs, and in Gallup's consumer spending data, which has been strong ever since last December, even in the face of the payroll tax increase. 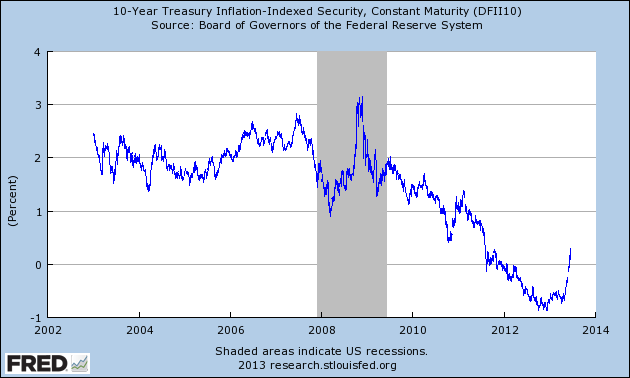 This is also of a piece with the new post-recession lows in the savings rate. I believe thie is the beginning of a very slow sea change. Consumer prices for May were reported on Tuesday as having risen +0.1%, in line with my prediction based on gas prices of +0.2% +/-0.1%. I haven't been making these forecasts just as an exercise in crystal ball gazing (well, okay, maybe just a little), but also as a way of elaborating on a theme I've been writing about for a long time -- the major but largely unremarked impact of the secular increase in gas prices on the consumer economy. What I've been trying to show, among other things, is that the relative change in gas prices has been the driving determinant in whether wages fall behind, keep up with, or increase vs. the general price level since gas prices bottomed in 1999. With gas prices finally plateauing or even declining slightly in the last year, real wages have started to increase again.I believe this is an important reason why the economic expansion has so far survived both the payroll tax increase and Sequestration. Will Oil Finally Break Through the 98 Price Level? 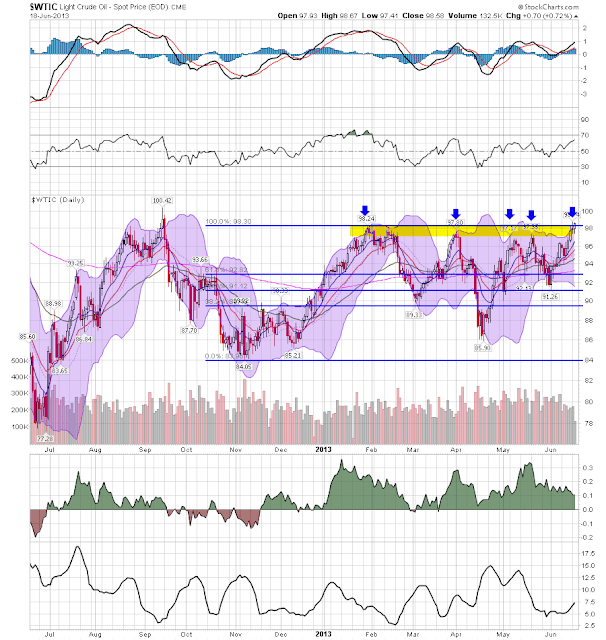 The 98 price level has provided strong resistance for oil prices this year. Yesterday prices closed at 98.58. Let's see if the upward momentum continues today. Professor Thoma of Economists View just announced that his wife has passed away. On behalf of all here at the Bonddad Blog, we want to extend our deepest sympathies. The May 2013 Empire State Manufacturing Survey indicates that conditions for New York manufacturers declined marginally. The general business conditions index fell four points to -1.4, its first negative reading since January. The new orders index also edged into negative territory, and the shipments index fell to zero. The prices paid index declined eight points to 20.5, indicating a slowdown in selling price increases, while the prices received index was little changed at 4.6. Employment indexes were mixed, showing both a modest increase in the number of employees and a slight decline in the length of the average workweek. Indexes for the six-month outlook were generally lower, suggesting that optimism about future conditions had weakened. In May, the seasonally adjusted composite index of manufacturing activity — our broadest measure of manufacturing — gained four points settling at −2 from April's reading of −6. Among the index's components, shipments recouped seventeen points to 8, the gauge for new orders slipped two points to finish at −10, and the jobs index subtracted six points to end at −3. We also see this slowdown in the overall industrial production numbers coming from the Federal Reserve. The above chart breaks the US down into market groups. In 4 of the last 7 months we've seen weak readings from the final products and non-industrial supplies sector. Non-durable goods have printed weak readings in 3 of the last 7 months, and non-energy has printed weak readings in 2 of the last 3 prints. The overall domestic economy is "sluggish and pensive" with a "flat' outlook and some markets have recently "softened." Cuts to government spending are having an impact. The international slowdown is also hurting. The sky is not falling. But things are definitely grinding lower. 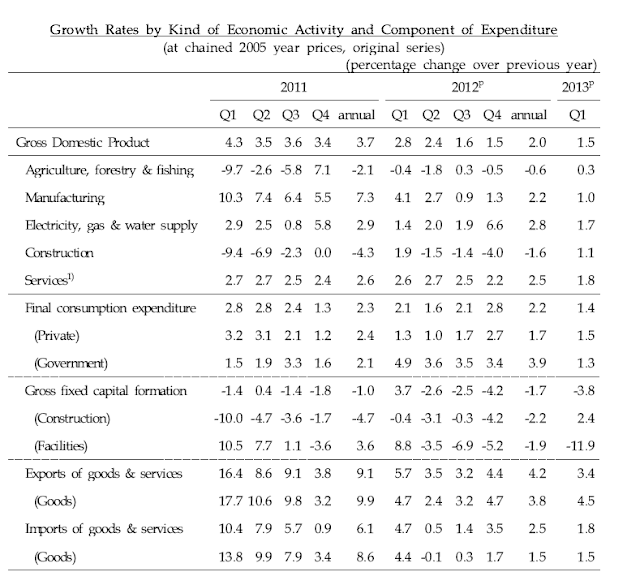 The latest information on the performance of the economy in the first quarter of 2013 suggests that this slowed down in comparison to what had been seen at the end of last year as was predicted in earlier reports. The indicators for that period are influenced by the lower number of working days in February and March. In the first quarter of the year, household consumption grew at rates that were slightly lower than the ones registered in the fourth quarter of 2012. According to the figures from the Retail Monthly Sample (MMCM in Spanish) published by DANE in March, the annual growth of sales was 0.9% in the first quarter (less than the 3.3% for the last quarter of 2012). This performance could be explained by an annual drop in the sales of vehicles (-11.4%). In contrast, sales of other goods grew 4.0% in the first three months of the year. With regards to the supply indicators, the news shows mixed performance. Production of coffee continues to expand at favorable rates. Energy related mining showed positive growth in petroleum production while coal production was affected by labor problems and environmental penalties. The industrial sector registered significant deterioration during the quarter. In March, the index of industrial production excluding threshing shrank 11.5% in annual terms. Based on this rate, industrial production showed an annual contraction of 6.0% in the first quarter. So households are still spending, albeit at slower rates. The real problem is in industrial production. This exact same situation is playing out in the US. Colombia sure likes to keep the markets on their toes. On Friday, the country cut its benchmark interest rate for the fifth consecutive month. While previous cuts came in at 25bps increments, the central bank took out the axe this time around and chop rates by 50bps to 3.25 per cent – the lowest in Latin America. Since the beginning of February, the market has been moving lower. 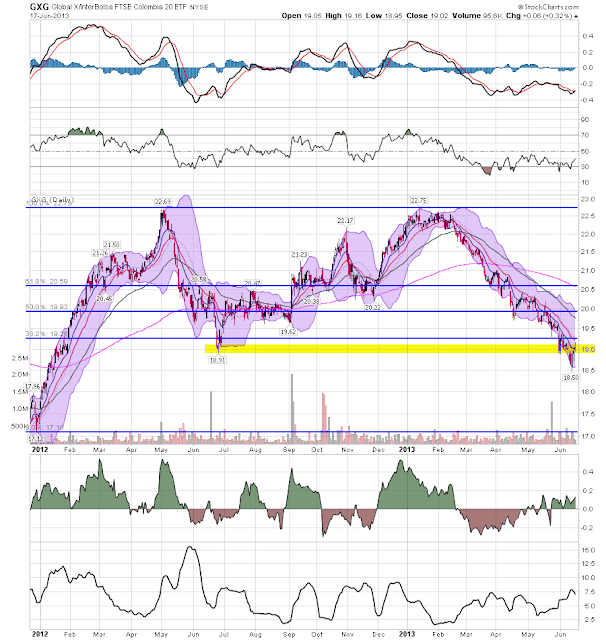 But remember that this move lower has been very disciplined. There has not been a massive volume spike indicating a selling climax. 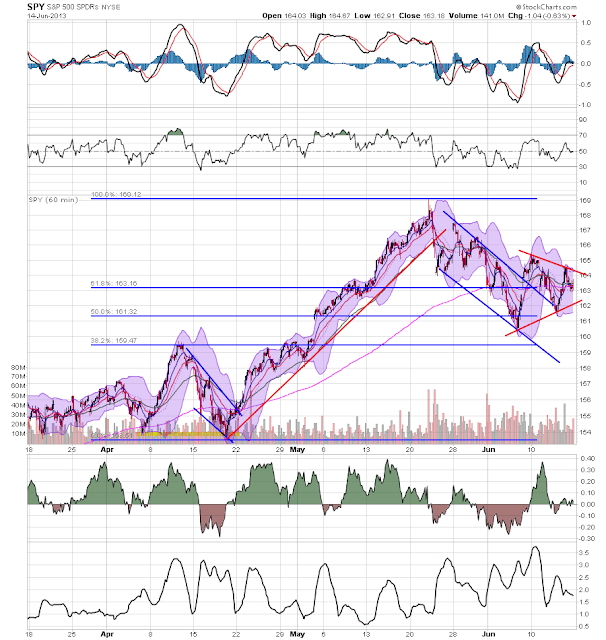 Instead we see a nice pattern of lower lows, followed by consolidation, followed by another disciplined move lower. Prices are below the 200 day EMA are are using the 10 and 20 day EMAs as technical resistance. While the CMF is indicating some volume moving into the market, momentum is negative. The weekly chart shows that the current price level is around the 38.2% Fib level for the 4Q11-1Q13 price move. While we do see a slight uptick in volume over the last few months, it does not indicate a selling climax. Could Economic Blogging Get Any More Boring? Stop me if you're read this before. The EU is in a recession, the US is in slow-growth mode and China is rebalancing its economy. The sluggishness in developed economies is slowing the growth of emerging economies. Well - you have read that before. In fact, that's all anyone has been writing for the last year to year and a half. Based on currently available information, the Committee considers the moderate economic recovery in the US to have continued, but the sluggishness of economic activities in the euro area to have persisted. Economic indicators in emerging market countries have shown signs of gradual improvement. The Committee expects the global economy to exhibit a modest recovery going forward but judges the downside risks to growth to be large, owing chiefly to the euro area fiscal crisis and to the fiscal consolidation issue in the US. downside risks to growth to be large, owing chiefly to the spillover of the euro area fiscal crisis to the real economy and to the possibility of the so-called fiscal cliff materializing in the US. And don't get me started on how often the Fed has used the word "moderate" in the Beige Book. I read a ton of central bank announcements. They all contain a general outline of the then current economic environment. For the last year and a half, they could all just say, "that thing we wrote last month? Ditto." I just wanted to mention from a writing about the economy perspective, it's just really boring right now. Trend estimates: The May 2013 trend estimate (93 439) has decreased by 0.6% when compared with April 2013. Seasonally adjusted estimates: The May 2013 seasonally adjusted estimate (93 209) has increased by 27 units when compared with April 2013. Moreover, the trend has been declining for six months. 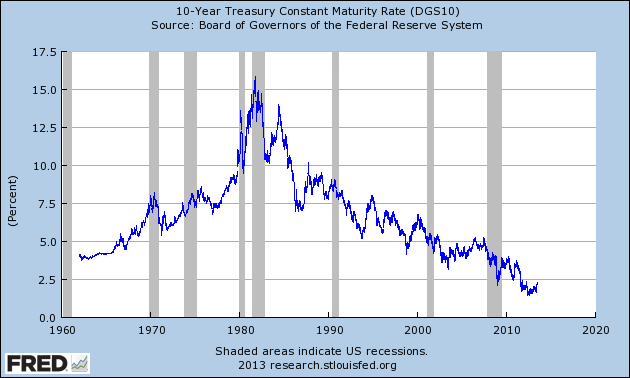 Click the link to see the accompanying chart; it's not a pretty sight. Barry had this up on his blog over the weekend. It is one of the best economic lectures I have ever seen. Blyth is brilliant, funny and deeply irreverent. The lecture is a little over 50 minutes and worth every minute of your time. Here's his explanation of the the "confidence fairy" which is from the video starting at about 45 minutes. First, import prices declined: Prices for U.S. imports declined 0.6 percent in May, the U.S. Bureau of Labor Statistics reported today, after a 0.7 percent drop the previous month. Falling fuel and nonfuel prices contributed to the decreases in both months. U.S. export prices fell 0.5 percent in May following declines of 0.7 percent in April and 0.5 percent in March. What's interesting here is that non-fuel imports have also been dropping. from the same period a year ago. The March to April 2013 percent change was unrevised from 0.1 percent (±0.3%)*. This is by far the best news of the week. With manufacturing slowing consumers will have to provide more economic activity to keep the economy moving forward. This report indicates they're more than up to the task. Equally impressive was the .3% increase ex-autos. Producer prices are right on the edge of being a concern for a one-month print. The Producer Price Index for finished goods rose 0.5 percent in May, seasonally adjusted, the U.S. Bureau of Labor Statistics reported today. Prices for finished goods fell 0.7 percent in April and 0.6 percent in March. At the earlier stages of processing, prices received by manufacturers of intermediate goods declined 0.1 percent in May, and the crude goods index advanced 2.2 percent. On an unadjusted basis, prices for finished goods moved up 1.7 percent for the 12 months ended May 2013. Regarding PPI, most of the increases are due to large movements of single products that make up an index. For example, fuel prices account for 60% of the increase in finished goods while a 41.6% increase in egg prices is responsible for over 60% of the increase in finished consumer foods. Also note that 2/3 of the increased in the finished core prices are attributable to a .4% increase in light trucks and autos. It's entirely likely that the prices related to eggs and autos are one-off events. 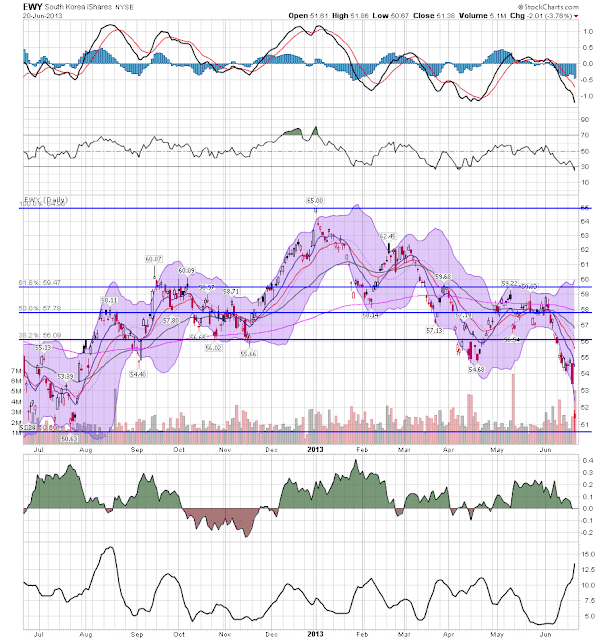 Energy is a bit more volatile, but there isn't much demand pull or price push pressure right now. There is no way anyone can say that inflation is an issue or even a potential issue in the current environment. However, bigger moves in a single month's print of an inflation statistics is something to keep your eye on going forward. Industrial Production was unchanged: Industrial production was unchanged in May after having decreased 0.4 percent in April. In May, manufacturing production rose 0.1 percent after falling in each of the previous two months, and the output at mines increased 0.7 percent. The gains in manufacturing and mining were offset by a decrease of 1.8 percent in the output of utilities. At 98.7 percent of its 2007 average, total industrial production in May was 1.6 percent above its year-earlier level. The rate of capacity utilization for total industry edged down 0.1 percentage point to 77.6 percent, a rate 0.2 percentage point below its level of a year earlier and 2.6 percentage points below its long-run (1972–2012) average. The good news is the print wasn't negative. The bad news it the print was just barely good. And the .1% overall increase in manufacturing -- especially on the heels of two straight contractions -- is pretty concerning. It does appear that external events like the global slowdown and the sequester are starting to take a bigger bite out of manufacturing. US Export prices dropped: U.S. export prices fell 0.5 percent in May following declines of 0.7 percent in April and 0.5 percent in March. Lack of pricing pressure indicates that exporters may be under profit margin pressure over the next 3-6 months. 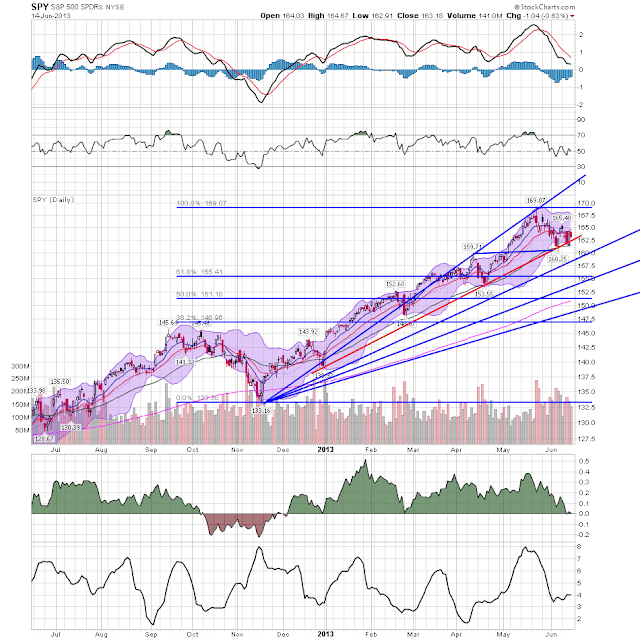 The daily chart (top chart) shows that prices are using the trend line connecting the early January and mid-April lows as technical support. 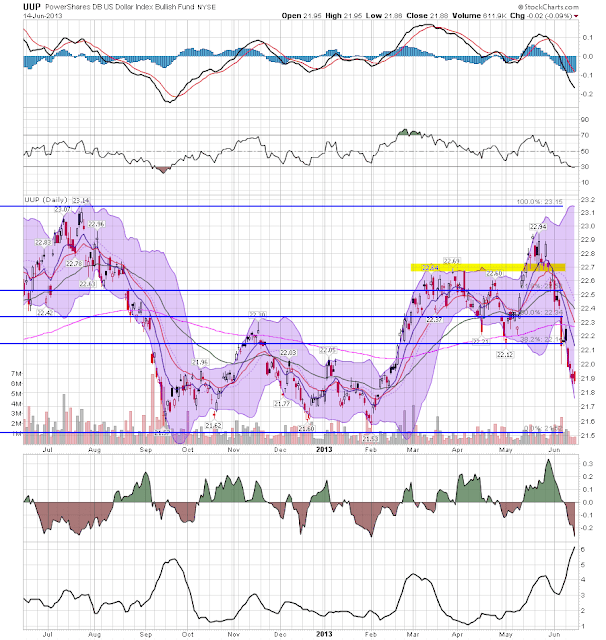 The high from early April in the 159-160 and 50 area is providing support as tell. The technicals are bearish: the shorter EMAs are entangled with prices, while the MACD and CMF is declining. 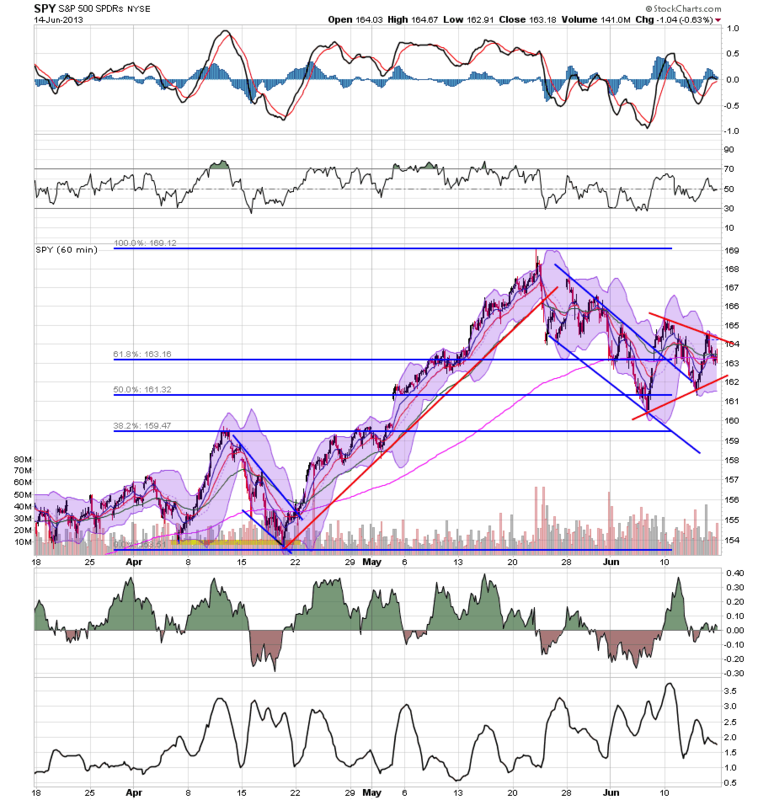 The top chart is the 60 minute prices chart and shows that prices are consolidating in a triangle pattern. The big story in the bond market -- and all markets at large -- is when will the Fed start to taper off its bond buying program. Last week, there was an emerging concensus it would be soon -- leading to the sell-off in the bond markets. However, traders started to change their minds about that assessment, leading the bell of the treasury curve to rally above resistance. As it stands right now, the IEIs still have support at 122 and the IEFs at 105. The dollar has broken support at the 38.2% Fib level with the new price target of ~21.5. 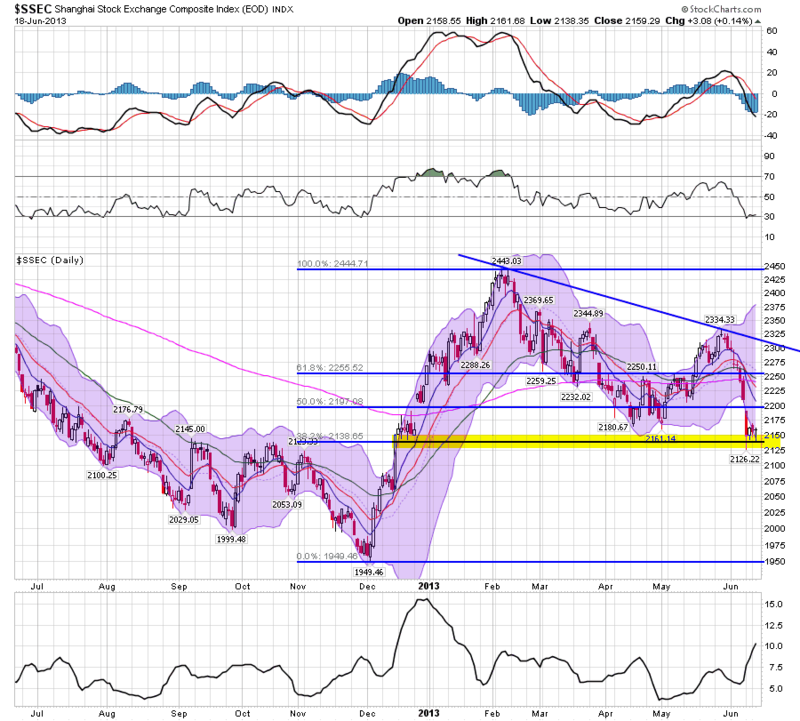 Any rally will hit resistance at the 10, 20 and 200 day EMAs as well as the 38.2% Fib level. Market outlook for the week: slightly negative. The dollar's drop indicates that traders are short-term bearish on the US, which is confirmed by Treasuries inability to make a sustained move below support.